Toms River and Seaside Heights homeowners were among five New Jersey residents charged Tuesday with fraud related to the fraudulent acceptance of Sandy-related homeowner benefits. Patrick Yannotta, 28, of Hoboken, N.J., allegedly filed fraudulent applications following Superstorm Sandy for FEMA assistance and state grants under the Homeowner Resettlement Program (RSP) and the Reconstruction, Rehabilitation, Elevation and Mitigation (RREM) Program. As a result, he allegedly received $182,400 in relief funds to which he was not entitled. Yannotta allegedly falsely claimed in his applications that a home he co-owns with a relative on Coolidge Avenue in Seaside Heights, N.J., which was damaged by Superstorm Sandy, was his primary residence when Sandy struck. It is alleged that the property in Seaside Heights was not, in fact, Yanotta’s primary residence at that time. He allegedly was leasing it out to others as an income-producing rental property. As a result of the alleged fraudulent applications, Yannotta received $22,400 from FEMA, a $10,000 RSP grant, and RREM grant funds totaling $150,000. Yannotta is charged with second-degree theft by deception and fourth-degree unsworn falsification. Frank Russo, 83, of Brick, N.J., allegedly filed fraudulent applications following Superstorm Sandy for FEMA assistance and state grants under the Homeowner Resettlement Program (RSP) and the Reconstruction, Rehabilitation, Elevation and Mitigation (RREM) Program. As a result, he allegedly received approximately $190,813 in relief funds to which he was not entitled. Russo allegedly falsely claimed in his applications that a home he owns on Bayview Drive in Toms River, N.J., which was damaged by Superstorm Sandy, was his primary residence when Sandy struck. It is alleged that, in fact, his primary residence at the time of the storm was in Brick Township, and the Toms River home was unoccupied. As a result of the alleged fraudulent applications, Russo received $30,813 from FEMA, a $10,000 RSP grant, and RREM grant funds totaling $150,000. 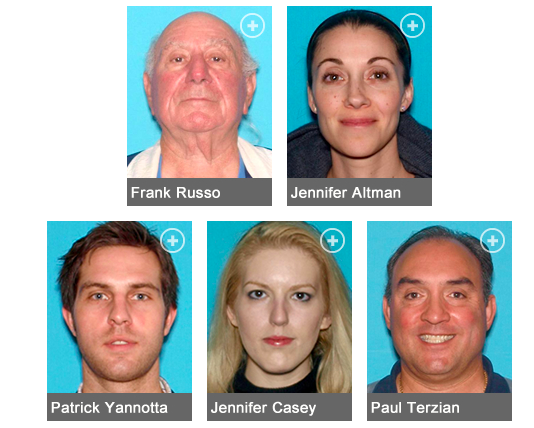 Russo is charged with second-degree theft by deception and fourth-degree unsworn falsification. Jennifer Altman, 43, of Hoboken, N.J., allegedly filed fraudulent applications following Superstorm Sandy for FEMA assistance and state grants under the Homeowner Resettlement Program (RSP), the Reconstruction, Rehabilitation, Elevation and Mitigation (RREM) Program, and the Sandy Homeowner and Renter Assistance Program (SHRAP). As a result, she allegedly received approximately $183,220 in relief funds to which she was not entitled. Altman allegedly falsely claimed in her applications that a home she owns on Maria Drive in Toms River, N.J., which was damaged by Superstorm Sandy, was her primary residence when Sandy struck. It is alleged that, in fact, her primary residence at the time of the storm was in Hoboken. As a result of the alleged fraudulent applications, Altman received approximately $12,132 from FEMA, a $10,000 RSP grant, RREM grant funds totaling $150,000, and approximately $11,088 in SHRAP funds. Altman is charged with second-degree theft by deception and fourth-degree unsworn falsification. Jennifer Casey, 33, Upper Saddle River, N.J., allegedly filed fraudulent applications following Superstorm Sandy for FEMA assistance and state grants under the Homeowner Resettlement Program (RSP) and the Reconstruction, Rehabilitation, Elevation and Mitigation (RREM) Program. As a result, she allegedly received approximately $174,912 in relief funds to which she was not entitled. Casey allegedly falsely claimed in her applications that a home she owns on Cove Point Road in Toms River, N.J., which was damaged by Superstorm Sandy, was her primary residence when Sandy struck. It is alleged that, in fact, her primary residence at the time of the storm was in Upper Saddle River, N.J., and the Toms River home was unoccupied. As a result of the alleged fraudulent applications, Casey received $2,900 from FEMA, a $10,000 RSP grant, and RREM grant funds totaling $162,012. Casey is charged with second-degree theft by deception and fourth-degree unsworn falsification. Carlos Paul Terzian, 54, of Manahawkin, N.J., allegedly filed fraudulent applications following Superstorm Sandy for FEMA assistance and a state grant under the Homeowner Resettlement Program (RSP). As a result, he allegedly received approximately $30,021 in relief funds to which he was not entitled. Terzian allegedly falsely claimed in his applications that a home he owns on Joshua Drive in Manahawkin, N.J., which was damaged by Superstorm Sandy, was his primary residence when Sandy struck. It is alleged that, in fact, the storm-damaged property was a secondary home that was unoccupied when the storm hit, and his primary residence was another home in Manahawkin. As a result of the alleged false applications, Terzian received approximately $20,021 in FEMA grants and a $10,000 RSP grant. Terzian is charged with third-degree theft by deception and fourth-degree unsworn falsification. Second-degree charges carry a sentence of five to 10 years in state prison and a fine of up to$150,000. Third-degree charges carry a sentence of three to five years in prison and a fine of up to $15,000, while fourth-degree charges carry a sentence of up to 18 months in prison and a fine of $10,000.